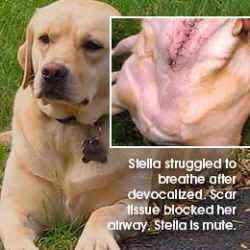 It started with Massachusetts, which in 2010 became the first state with a real law banning devocalization—the cutting of vocal cords to stifle a dog’s or cat’s voice. On April 14 at 10:30 a.m., Gov. Martin O’Malley is scheduled to sign the law that will make Maryland the second to prohibit this cruel convenience surgery. Gov. Martin O’Malley for not yielding to veto pressure from lobbies with a financial interest in devocalization. Delegate Ben Kramer, who introduced this important humane legislation. The Delegate adopted our suggestions for strengthening his original bill. And he fought to ensure it passed in that form. The Maryland State Legislature, which took a principled stand for animals--and responded to the concerns of humane people like you. HSVMA, which stood shoulder-to-shoulder with Coalition to Protect and Rescue Pets in opposition to loopholes. And all of you who acted on our email alerts, FB posts and Tweets. Powerful lobbies that profit from this cruel elective surgery worked to defeat the law. They hoped to kill it outright or worse, with sneaky loopholes. YOU stopped them by using YOUR voice to speak for dogs and cats. Coalition to Protect and Rescue Pets is an all-volunteer advocacy group that does NOT accept financial donations. We ask that you support your local, volunteer-fueled shelter or rescue group instead. With your help, we proved it doesn't take money to make a positive difference for animals. It takes action.